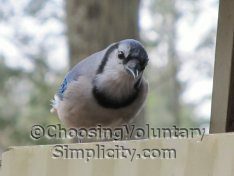 Home » Reader Questions / Sensible Frugality / Simple Living / Voluntary Simplicity » Can Credit Cards Be Used Responsibly? 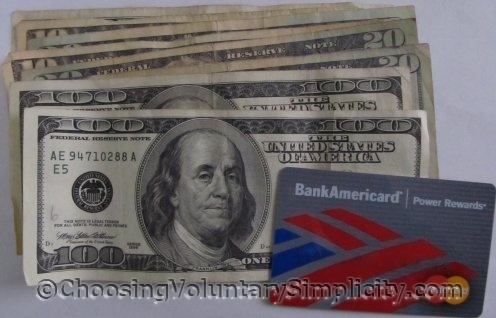 Reader question… “Would you share your thoughts about the cash envelope system versus the use of credit cards? I read today that any use of a credit card is irresponsible and that anyone using a credit card will end up spending more money than if they used only cash. Do you agree?” –Anne B.
I’m glad you asked this question because no, I definitely don’t agree. One of my pet peeves is the “one size fits all” approach to simplicity and frugality… the cash envelope system is a perfect example of an inflexible fix that is being promoted as the only responsible solution for everyone. It isn’t. Obviously there are people who can’t (or won’t) control their spending, and these people should definitely avoid credit cards completely. However, insisting that there is no responsible way to use a credit card and that EVERYBODY will spend more if they use one is ridiculous. Many people can (and do) use credit cards in a responsible way without extra spending and without accumulating huge debts. These people are just as responsible and just as “frugal” as the people who pay for everything with cash. Properly used, a credit card is just a financial tool, like cash or your checking account… and a credit card that gives cash back can actually earn money for you in the same way that a savings account accumulates interest. A credit card also provides valuable buyer protection if there is a problem with a service or purchase. Like many, many other people, we use a credit card when we shop for groceries, pay the electric and telephone bills, whenever we buy gasoline and heating fuel, for major purchases like appliances, and for our business expenses. Most of these are regular expenses that must be paid month after month, and the amount we have to pay remains the same regardless of what payment method we use. It just makes sense to pay with the credit card and accumulate the cashback bonus that we would not receive if we were using only cash. And like many, many other people, we keep a detailed accounting of every charge and we always pay the full credit card balance at the end of every month. Obviously the use of a credit card does require personal discipline, and I definitely do not advocate carrying a credit card balance month to month. But when a credit card is used thoughtfully and with common sense, it is just another responsible way to handle your finances. A cash envelope system is definitely NOT the only frugal option. All of my credit cards offer at least one percent back, and my Shell card gives back five percent on gas purchases. All of the cards are paid in full each month. When you consider that many bank savings rates are currently less than one percent (I have one small account at a local bank that currently pays .01 percent, but I keep it open for check cashing and the free ATM), I make a better return by spending my money than saving it! Not really, of course, but it is something to think about. Thank you, thank you, thank you! Someone else who lives simply, but uses a credit card! There are so few people of my acquaintance now that do so, and it’s frustrating. I use mostly cash (which I rarely carry on me, except my gas money which stays in a hidden spot in my car) because I know myself well enough to know that if I keep any type of money on me (I don’t routinely carry my checkbook, credit cards, or debit card anywhere), I will spend it and I refuse to get into more debt than I can handle (currently, I’m simply stuck with my school loans…). I do use my credit card for purchases that I have money set aside already for those things (car maintenance, etc.) and it redeems money for my favorite vacation destination (I have the Disney Reward Card…). I am currently saving my rewards for my next trip with some of my friends. I have one other card that I very rarely use. I keep it only because the account has been open for a long time and that is good on my credit rating. Every once in a while, I utilize it to purchase something small, just to keep the account active, but never without the money set aside. This is all probably more than you wanted to know, especially since I am writing simply because I am happy to find others who utilize a similar system to me. In the past year I have used the extended warranty feature of my credit card two times. My card also provides free roadside assistance as well as travel insurance. That’s not bad for a credit card that doesn’t cost anything and gives back 1%. Like Kevin, I do pay off my balance in full every month. I actually find credit cards to be an easier way of keeping track of money. Cash and change disappear all too easily from my wallet, but when I consistently use my credit card, I can easily keep track of every dime I spend. It’s much more convenient than trying to count pennies at the grocery store while trying to keep track with the 4yr old, who regularly wanders off chatting with any stranger who smiles with him. I paid off my last credit card balance in 1999 and have kept the card paid off monthly since then though I use it for most of my purchases. This keeps my checkbook simple to balance. I pay only bills I need a receipt for or have to pay through the mail. And I pay the credit card balance, again, in full online each month. I’ve worried that I might spend more money than I would have with cash, though probably not with a check… but I’ve found the convenience enough to continue. Recently I paid my tuition with my credit card. Paying the balance in full this month has made things tight until payday, but I had hoped to not pay interest and I didn’t have to. My other options were to take out a student loan, but I didn’t want a long-term loan hanging over me, or to borrow from my 401K but that was more trouble and expense (an up-front $75 fee) than it was worth. Both of those options would have required interest. So, I put the tuition on my card, thinking I might have to leave a few hundred dollars there until next month. My interest rate is pretty decent for a no-fee, point-earning credit card (I did not earn points for the tuition, btw). Credit cards were my downfall during most of the 1990s. But they weren’t fully the enemy; I put myself in a bad place and they helped me to get there and stay there. One more thing, as soon as I’m paid at the end of the month, I’m starting to save for the next tuition payment. I plan to be more prepared for it next time and to not have to sweat it. Super post! We do the same. We benefit quite a bit from using credit cards. We pay off the balance every month and use the cash back bonus for gift cards to our grocery and hardware store. We never pay finance fees this way; payments are automatic so that we never forget. There are months where the cash back bonus is 5%. The free money is great if you can discipline yourself to treat the card like a checking account. You are so right; it’s just a tool, and a very handy one at that. Finally, some common sense advice about using credit cards! I am sick of people blaming their credit cards for their own lack of money sense. Like you I pay all my expenses with a credit card and those cash bonus points are a Godsend. I wish people would learn to use their credit cards sensibly and buy only what they can afford. Thanks for the super article. This is exactly what we do! We buy everything with a credit card just so we can rack up points. We never buy anything we wouldn’t normally have bought and always pay it off at the end of the month. I guess we think of it kind of like a debit card -if the money is not in the bank, we don’t put it on the card. Shirley, you are so right about this. Like you I pay the entire amount due each month and never carry a balance. My viewpoint is that it is more sensible to get all the perks and points from a credit card than to use cash but mostly I don’t like the contempt some of the cash-only people have towards credit cards in general and people who use them. It was very refreshing to read this post and see another viewpoint. Thank you. One trick that we have found useful is to subtract our credit card purchases from our total in our check register as we charge. This way, we consider the money spent and when we pay off our balance each month, it is painless! Regarding credit card usage, I completely agree with you. One idea that I would add about credit cards is that in addition to convenience, having a credit card is beneficial for building credit history. Having good credit is very advantageous in a number of ways. Not only can very poor credit limit borrowing money, I understand credit can also impact employment. Contrarily, having very good credit enables you to take advantage of various programs and bank incentives that give you the ability to take on different investment projects like home improvement that may not be possible without having that history or the full capital needed to pursue them otherwise. Loving this article. A credit card used properly is FREE money! If used directly after the statement date effectively the company is lending you money for up to around 56 days FOC if you pay it off in full on your due date each time, plus they offer cashback, airmiles, depending on your card, also guarantees on purchases made on them over a certain amount (called section 75 in the UK) Couple that with not having to carry lots of (dirty) cash about, what is not to like. I believe my credit cards are great tools. I have about 6 of them and I never carry a balance. I live in a big city and if my purse should get stolen or lost, I don’t have to worry about losing money. I don’t have to carry loads of cash with me. I have excellent credit and the cards pay me awards cards that I can use anywhere. For me it is a no brainer and I have never used the cash envelop system, but I do use a spread aheet to track my money and everything that comes into the house. I even keep an inventory of food for tracking purposes. My system fits me so I use it to my advantage so I agree that one size does not fit all. I have a Visa that earns you Reward Points. I use it for almost everything (except groceries – I have another credit card for that and it offers cash back) and by the end of the year I have enough Rewards Points to buy gift cards that I use for Christmas gifts – talk about win win. I always pay the balance of each card every month and I won’t have a credit card that charges any kind of annual fees. Credit cards are great financial tools – but like any power tool – you need to be careful how you use them. I couldn’t agree more about how ‘one size fits all’ just doesn’t work. I have never had a problem with credit cards and have always paid in full each month starting with my first credit card in high school. Having this credit history enabled me to do many things at an earlier age then many of my peers. Now my husband and I use multiple credit cards to maximize points for free traveling. Should everyone do this? ABSOLUTELY NOT. If the thought of a credit card is a temptation to spend more money you don’t have…don’t have one. Or have only one and make sure the credit limit is low enough that you cannot over spend. Always pay it off month to month. Should everyone have a credit card? No. Should no one have a credit card? No. Thanks for airing this topic! Things are rarely if ever one size fits all. I have one credit card and it’s paid off in full each month. It allows me to rent cars, book hotel reservations, order seeds and other supplies online. None of these could be done with cash. I personally find cash to be the less frugal option. When I have cash I want to spend it. When I have to swipe a card, even if it’s just my debit card, I am more likely to think about if I really need to make this transaction or not. I agree completely. I had run up some debt (nothing more than $2000, but when you’re a college students, two thousand might as well be ten) when I was in college and as soon as I got it paid off I was without a credit card for about 5 years. I then applied for a prepaid card through my bank (I didn’t qualify for anything else) and after 2 years it turned into a normal card. My debt maximum has risen from $1,000 to $10,000, but there is NEVER anything more than about $500 on it at any point in time. I’ve learned to control my spending and use the card responsibly. I think you are spot on about one-size-fits-all debt management. Thanks for posting this! Totally agree. It’s crazy not to use your credit card and forfeit the cash back. We use our credit card whenever we can. Very good essay. And, I used to do the “envelopes” for many years. I agree with VS and comment. Both cash and credit takes a lot will power to stay within a set goal. With cash, you will only spend what you have in your pocket (leave the checkbook at home); with credit, if you pay all charges back each month every time you are OK and it is easier to get resolution if a purchases goes awry. A debit card is another ballgame you need super will power!